At Athena Clinic in Hawaii, rhinoplasty can have dramatic results on a person’s appearance and self-confidence. Rhinoplasty can accomplish any number of changes, including size augmentation or reduction, narrowing of the nostrils, changes in the bridge or tip of the nose, or an alteration to the angle of the nose and upper lip. 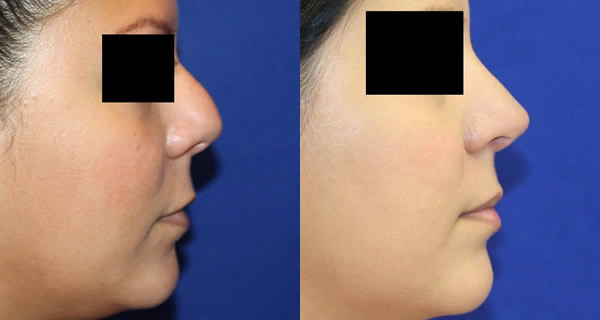 Regardless of the specific purpose, rhinoplasty can create a more shapely nose and balanced appearance. At the Athena Clinic in Hawaii, rhinoplasty surgery begins with an incision, either from within the nose or across the columella (the vertical strip separating the nostrils). The skin is then separated from the underlying framework of the nose and sculpted to the desired shape and size. Finally, Dr. Peterson reattaches the skin to the new contoured framework, and closes the incision. The procedure typically lasts an hour or two and is performed on an outpatient basis. At Athena Clinic in Hawaii, following rhinoplasty, a splint or bandage is required to maintain the new shape. Patients may experience swelling and bruising to the eyes and nose but medication can greatly reduce any discomfort. Stitches are usually removed in five to seven days. To schedule a consultation for any of these procedures, contact Robert Peterson MD at the Athena Clinic in Honolulu today, or read on for more information. You may also be interested in the following procedures facelift, brow lift or lip augmentation. Download this information on rhinoplasty as a PDF.